No one was seriously hurt. Some residents had run around the building, banging on doors and telling their neighbors to get out of the building because it was on fire. At least six apartments were destroyed early Thursday morning by a fire at the Oaks Condominiums building in northwest Gainesville. The blaze displaced about 25 residents and reminded others about the dangers of fire. It started at about 5:30 a.m. in the complex at 6519 Newberry Road, according to Gainesville Fire Rescue Operations Chief Stephen Hesson. Alachua County Fire Rescue and Gainesville Fire Rescue responded to fire in multiple condo units and reported heavy flames on the upper floor and attic of the three-story building, Hesson said. He said firefighters tried to put out the fire inside the building but quickly had to evacuate because of potential building instability. Hesson said that firefighters were able to get the fire out in about 35 minutes. 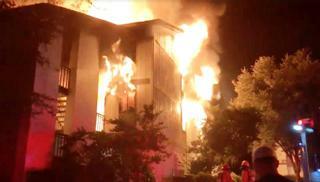 This image from video shows a fre at the Oaks Condominiums in northwest Gainesville. Luckily, Hesson said, citing reports from residents, several people ran around the building, banging on doors and telling their neighbors to get out of the building because it was on fire. Kevin Purser, 37, was one of those people. Purser, who said he lived on the third floor of the building, woke up to smoke inside his condo. He said he had been sleeping on a couch in his living room. After noticing the smoke, he said he ran out the front door. Purser said his efforts to notify neighbors of the fire were just the right thing to do — not heroic actions. One dog was removed from the fire at the condos and revived using a pet mask to deliver oxygen. Out of the twelve condo units that caught fire, six are considered a total loss, and 25 to 30 people are displaced because of the fire. As of Thursday afternoon, it was unclear what started the fire. Suraj Maharjan, 29, who lived on the bottom floor, said his condo and everything inside of it is gone. On Thursday morning, he spoke to The Sun wearing clothes borrowed from a friend. Maharjan said he and his wife had fallen asleep Wednesday night after watching a movie and woke up to loud bangs on their door and desperate voices, pleading for them to get out of their condo. He said they wouldn’t have woken up if it wasn’t for the commotion. Residents reported no smoke detectors or alarms sounded during the fire. As of Thursday morning, the Red Cross was on scene providing assistance. Purser said his information had been entered into a registry and he was waiting on a call to find out how the Red Cross could help. Thursday’s fire is the second major residential fire within a week. On Monday, a fire started around 1 p.m. at Granada Apartments, 1800 NW Fourth St., next to the Sidney Lanier Center. The fire killed a man who lived there. Hesson said residents can keep themselves safe by ensuring they have proper and working smoke detection equipment in their homes.